NO PURCHASE IS NECESSARY TO ENTER OR WIN. ALL FEDERAL, STATE, LOCAL AND MUNICIPAL LAWS AND REGULATIONS APPLY. VOID WHERE PROHIBITED. Contest entrants will be asked to submit stories, pictures and/or videos online via social media that showcase a promposal. 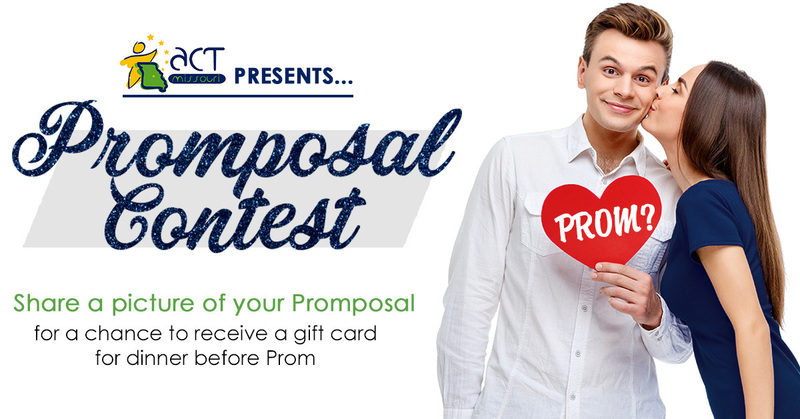 ACT Missouri’s Promposal Contest is open to legal Missouri residents who are currently enrolled as a student in a Missouri K-12 public school and their parents or guardians. Employees of ACT Missouri and other companies associated with the promotion of the contest, and their respective parents, subsidiaries, affiliated and advertising and promotion agencies as well as the immediate family (spouse, parents, siblings and children) and household members of each such employee are not eligible. The Contest is subject to federal, state and local laws and regulations. The Contest is promoted by ACT Missouri, located at 428 E. Capitol, Jefferson City, Missouri 65101. The Contest will begin February 4, 2019 at 12:01 a.m. Central Standard time and ends May 10, 2019 at 12: 01 a.m. Central Standard Time (the Phase I “Contest Period”). Entries that are submitted before or after the Contest Period will be disqualified. Submissions will be accepted for the duration of the Contest only. Online: This method of entry will be available by visiting the website (www.actmissouri.org) and following the directions provided to fill out the entry information, and submit. 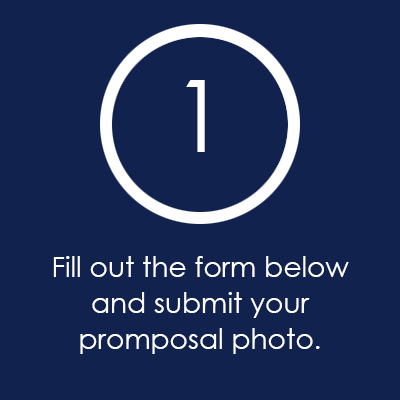 Mail In entries may be submitted by writing name, phone number and email address on paper and submitting it along with a promposal photo. These submissions must be mailed to and received by ACT Missouri during the contest period. Mail in forms should be sent to ACT Missouri, 428 E. Capitol, 2nd Floor, Jefferson City, Missouri 65101. 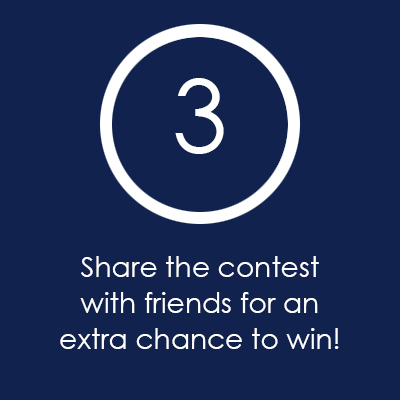 Limit one: (1) entry per person, for the duration of the Contest Period. Multiple entries in excess of the stated limitation will be void. All entries become the property of Sponsor and will not be acknowledged or returned. By entering this competition, the entrant agrees that ACT Missouri may use his/her name, story and image in any publicity or advertising material, including but not limited to social media accounts, ACT Missouri website and microsites, television, radio and/or printed media. For those entrants under 18, a parent or guardian must agree to the entrant’s participation and use of their name, story and imagery for media campaigns after the contest. Any personal data relating to the winner or any other entrants will be used solely in accordance with current US data protection legislation and will not be disclosed to a third party without the entrant's prior consent. On or about May 11, 2019, ACT Missouri will randomly select a winner from all eligible entries received during the contest period. The odds of being selected depend on the number of entries received. ACT Missouri will attempt to notify the winner via telephone or email on or about May 12, 2019. If the potential winner cannot be contacted within five (5) days after the date of the first attempt to contact him/her, the Sponsor may select an alternate potential winner in his/her place at random from the remaining non-winning, eligible entries. 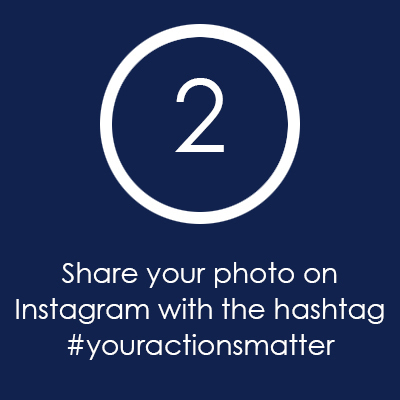 The potential winners will be notified by email, mail and/or phone. Each potential winner (parent/legal guardian if a minor in his/her state of residence) will be required to complete, electronically sign and submit a Declaration of Compliance. If a potential winner cannot be contacted, or fails to submit the Declaration of Compliance within the required time period (if applicable), or does not appear at the Award Ceremony to receive the prize, the potential winner forgoes their prize. If the potential winner is still considered a minor in his/her jurisdiction of residence, the sponsor reserves the right to award the prize in the name of his/her parent or legal guardian, who will be required to sign the Declaration of Compliance on the potential winner’s behalf and fulfill any other requirements imposed on winner set forth herein. Potential winners must continue to comply with all terms and conditions of these Official Rules, and winning is contingent upon fulfilling all requirements. In the event that a potential winner is disqualified for any reason, the sponsor may award the applicable prize to an alternate winner from among all remaining entries. A prize in the form of a gift card will be awarded. In the event that the operation, security or administration of the Contest is impaired in any way for any reason, including, but not limited to fraud, virus, bug, worm, unauthorized human intervention or other technical problem, or in the event the Contest is unable to run as planned for any other reasons, as determined by Sponsor in its sole discretion, the Sponsor may, in its sole discretion, either (a) suspend the Contest to address the impairment and then resume the Contest in a manner that best conforms to the spirit of these Official rules or (b) terminate the Contest and, in the event of termination, award the prize at random from among the eligible, non-suspect entries received up to the time of the impairment. The Sponsor reserves the right in its sole discretion to disqualify any individual it finds to be tampering with the entry process or the operation of the Contest or to be acting in violation of these Official Rules or in an unsportsmanlike or disruptive manner. Any attempt by any person to damage the website or undermine the legitimate operation of the Contest may be a violation of criminal and civil law, and should such an attempt be made, the Sponsor reserves the right to seek damages (including attorney’s fees) and any other remedies from any such person to the fullest extent permitted by law, Failure by the Sponsor to enforce any provision of these Official rules shall not constitute a waiver of that provision. Except where prohibited, each entrant agrees that any and all disputes, claims and causes of action arising out of, or connected with, the Contest or any prize awarded shall be resolved individually, without resort to any form of class action, and exclusively by the appropriate court located in Missouri. All issues and questions concerning the construction, validity, interpretation and enforceability of these Official Rules, entrants rights and obligations, or the rights and obligations of the Sponsor in connection with the Contest, shall be governed by, and construed in accordance with the laws of Missouri, without giving effect to any choice of law or conflict of law rules, which would cause the application of the laws of any jurisdiction other than Missouri.